Our 24-Pocket Mesh Shoe Bag stores up to 24 pairs of women's shoes. The pockets are made from a durable, nylon mesh which provides visibility of the contents to help you locate the shoes you want quickly and easily. The pockets are also a good size for storing hair accessories, makeup, toys and other small items when space is at a premium. Overdoor hooks make installation a snap. A chemical-free, eco-friendly freshener, Remodeez Natural Odor Removers uses activated charcoal to absorb moisture and odors. Place one in a gym bag, locker, closet or luggage, and let it go to work. You can even recharge Remodeez every month simply by setting it in the sun. 24-Pocket Mesh Over the Door Shoe Bag is rated 4.6 out of 5 by 110. Rated 5 out of 5 by duInspire from Bottle Holder We are Avid cyclist and runners. I am using the mesh shoe holder as a water bottle and nutrition corner. I can put everything I need for hydration in one convenient spot. Rated 5 out of 5 by Jenmomofthree from Love Seeing My Flip Flops & Sandals Displayed! Great way to store, display and hold all of my summer sandals and flip flops. I can easily match what I’m wearing using this vertical system. Rated 5 out of 5 by mamajudd from Awesome storage! We were looking for one of these to store hats, mittens, gloves, and scarves and this one was perfect. We hung it in our coat closet. It is heavy duty so it can withstand the abuse of our four children and it is see through so they can easily find what they are looking for. Rated 5 out of 5 by gailforces from Love this! I absolutely love these organizers.. They are made of strong nylon mesh and hang on the back of a door. Now I keep my shoes neatly and I can see my selections all at once. Rated 5 out of 5 by Robbie54 from A Shoe-In for Storage I have had this storage bag for at least 10 years, and it has now begun to tear. I will definitely purchase another as I was very pleased with its durability. I needed to use one pouch per shoe, so I stored 12 pairs and not 24. Rated 4 out of 5 by Evie2015 from Organization! I bought this for my babies nursery to put all the tiny bows, shoes, mits, hats etc... Its working great and you can see through the pockets. I have it color coordinated, hope it makes it easier to get ready and not shuffle into drawers and never use stuff because you forget what you have. Rated 5 out of 5 by Rhodester from Great for shower This is great to hang on inside of shower curtain. I like to use the s hook shower curtain holders since they r stronger. With the entire holder made of mesh (even the back), it dries easily and no mold issues. I know they make smaller pocket holders for showers, but my family needed more pockets to hold all the different soaps, shampoos, razors, etc we like to use. This is perfect for us. We've had it for several months now and we love it! Rated 5 out of 5 by Mike1 from Works Great for Flip Flops! Very good quality over the door shoe bag. Works great for flip flops and recommend it to anyone! Rated 4 out of 5 by ELOWISE from LOVE This Item, very versatile! I bought this for using in our expected second child's room (the smallest room in our house containing all the "extra" items that don't fit elsewhere in our house). Since there was not much room for more than her crib and changing table, this was a perfect item for all the small baby things (hats, socks, bibs, pacifiers, lotion, shampoo, diaper cream, diapers, swim diapers, etc.) keeping them reachable and easily visible. I also got one for my friend for the same purpose, which she LOVED and raved about! Now I want one for our master bedroom for all our small trinkets now that we have less time to keep those things tidy! IDEA: What I would like to see is one of these made in combination with a bar or rack for towels for behind/overthedoor; the top half being the organizer and the bottom half being a rack or holder for towels. 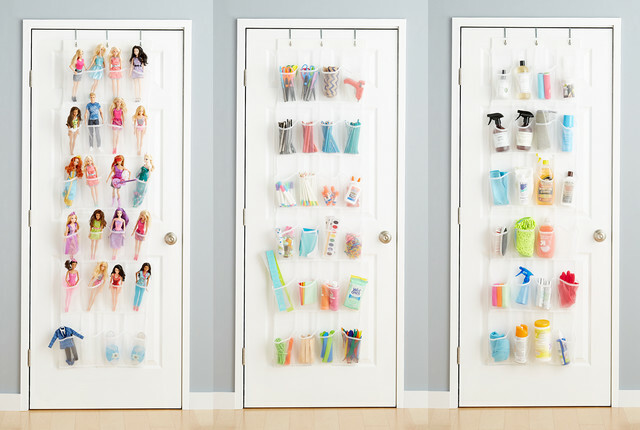 This would be ideal for using in our really tiny bathroom so I could keep lotions and products out of the kids reach and still have a place for towels out of sight. Rated 5 out of 5 by Bkateboley from Great "expansion" of closet space! My daughter LOVES shoes. Her shoes have outgrown her closet space. This shoe bag fit perfectly over her door-- THANK YOU for the wider, sturdy hooks!! The mesh allows her to see her shoes. Rated 5 out of 5 by TLCC from Purchased this shoe bag for a different use. I reorganized my kitchen pantry. It is ideal for instant oatmeal packages, paper products, sandwich bags, storage bags, etc. Allowed me to free up 3 shelves and clean out ugly boxes because it hangs on the door. Even used a couple of pockets for small packets of sugar and artificial sweetner. Possibilities are limitless. Rated 5 out of 5 by anniebc from Life is good! Finally a solution for my girls to see and reach their shoe collection. Three Classico adhesive hooks and a 24-pocket mesh shoe bag give a classy, no clutter solution for all their flip-flops, dress shoes and belts. So accessible my 3 and 6 year old can finally keep things organized. It's never too early to learn organizational skills! Rated 5 out of 5 by flautando from Better than the fabric type shoe organizers.Nice and clean looking. Rated 5 out of 5 by jparteach from Works perfectly I was looking for a way to store my shoes. This is a low profile overdoor shoe bag. The hooks still allow me to close my door easily and I really like the mesh fabric to keep things fresh. Rated 2 out of 5 by MartyRock from Large pockets, but problems with the overdoor The pockets in these are good size, and the product seems durable. However, there are three hooks from which this hangs over the door. For some reason, even though I believe I have the weight distributed evenly, the hook closest to the door hinge doesn't sit flat. I have to nudge it a bit while closing the door to actually be able to get the door closed. I am disappointed because, in reading other reviews, I was under the impression that these hooks sat flat and weren't a problem. I'd probably suggest hanging this off the back of a door that you don't open and close regularly...I'll probably hold onto it since it's one of the only solutions I have, with limited closet space. Rated 4 out of 5 by Florida05 from Off the floor Another great purchase was this overdoor shoe bag. Now my shoes aren't all over the floor anymore. Rated 5 out of 5 by MellieinSedona from Perfect for holding cleaning supplies I got the idea from Pinterest to use a shoe holder, such as this, on the back of your toilet room door to store cleaning supplies if you're limited on space. This is perfect! The mesh is very strong and appears that it may hold up for some time or at least I'm hopeful :-) I store everything from my spray windex bottle to my large metal spray disinfectant and they stay upright. I'll have to find a way to stabilize the bottom portion as it "jangles" a tad bit. Nothing dramatic, but I'd like it to be a bit quieter! Rated 4 out of 5 by Wootty from Well designed space saver Mesh is definitely better than the plastic versions. This fits just right in length and width so it's not in the way of the door lever when opening and closing the door. Only issue was with the hanging hooks, my door was apparently not as thick as it needed to be, and the hooks were in the way of the door closing until I put three sticky-back felt padded furniture slides behind the hardware where it connected to the holes to add just the right amount of thickness. It propped the hardware to perfectly rest flat on the top edge of the door, and the door opens and closes smoothly and consistently now. Love it. Rated 5 out of 5 by pareth from For more than just shoes! We recently moved to a smaller home with FAR fewer kitchen cabinets and storage around the house. I decided to use an overdoor shoe bag on the inside of our teeny linen closet to serve as storage for medications. Works great! You can see the medication easily and they are all separated nicely. Used a second Overdoor Shoe Bag for my shoes in the tiny walk-in master closet. Pouches are big enough to accommodate even Danskos and Allegria shoes! Love this Overdoor Shoe Bag! Rated 5 out of 5 by Kanela from Great solution This a great solution to my 5 yr old daughter's shoe clutter! It hangs neatly behind her door and she has easy access to her shoes. Also, it's made of mesh so the shoes breathe. Rated 5 out of 5 by PatBennettAZ from Great use in the bathroom! A friend of mine has an overdoor shoe bag for storing bathroom/hair products and I went to The Container Store to find one. The sales associate recommended this one, in mesh, just in case I put something in it that was damp. If you have minimal space in a bathroom for hair products/brush/lotions, this is a great use! when the door is open, no one sees it and yet, I have everything I need right there. You would be amazed at the items you will pop into one of the pockets, it's great! With the mesh, you see what is in there, so no worry about losing something in the bottom of pocket. My roommate saw it and is getting one for her daughter for Christmas, handy/practical use! Rated 5 out of 5 by nonni from Perfect for shoes This shoe storage bag holds ALL my summer shoes except sneakers. The floor is clear and I no longer trip in the dark. It's sturdy and I would recommend it to anyone. I actually recommended it to my daughter and she bought one, too. I have used a product like this in plastic and it cracked as soon as the weather turned cold. I don't anticipate that happening with this product. Rated 4 out of 5 by Tommy1743 from Out of the way It is great to get the shoes off of the floor and allows you to see what you need immediately. Rated 4 out of 5 by Grandparentsof4 from organize those little extras I bought this to organize my daughters headbands little purses instead of her throwing them on the floor. Now only her clothes are on the floor. Rated 5 out of 5 by gettingthere123 from Nice quality We use shoe bags on the mud room door for hats, mittens, gloves and various things for football practices (bug spray, sunscreen, hand warmers etc..) and this mesh one worked out well because we can see through the pockets to find what we are looking for. This shoe bag is longer and has more pockets than the one we replaced so we have extra space. We can fit 2 pairs of adult snow gloves in each pocket so they are a nice size. The pockets are more durable than they look which is nice. Rated 5 out of 5 by TheHive from Great for organizing spray paint cans I needed a way to organize my cans of spray paint. I was using a laundry basket but I never knew what colors I had. I hung this in the garage and now I can sort the paint according to color and place them upside down in each pocket (the proper way to store spray paint). It's neat, organized and pretty to look at too! Rated 5 out of 5 by jerzman94 from Good for other things We actually bought this to used in our linen closet to organize all of the small items that get lost in baskets. We've organized toothbrushes, toothpaste and other extra supplies we like to keep. We had one of those over the door wire organizers, but it had no back and every time the door opened, things would fall out. Plus, I was able to group similar items together. is the top bar reenforced? Are there any problems caused by the weight of a full shoe bag? I have not experienced any problems from the weight of a full bag. I have only stored flats in the bag, so I haven't tested it with a lot of weight. How would you suggest I attach the shoebag to the door without using the included hooks? My doors will not close completely using the hooks included. So I'm looking to attach it directly to the door, possibly using cup hooks or screws. Heavy duty peel and stick hooks. But why not use the hooks provided? If you need it to be lower, you could just add string or yarn. Is the back mesh also? Can this be nailed to a wall instead of hanging over a door? I&rsquo;ve used screws with large heads to hang it on a wall. It works great! What is the demision of the pockets ? The 24-Pocket Mesh Over the Door Shoe Bag pocket dimensions are 4&quot; W x 4&quot; D x 7&quot; H.
What width door will this work on? The 24-Pocket Mesh Overdoor Shoe Bag (item: 10024675) comes with hooks which work on a door no wider than 1-3/8&quot; thick. For commerical doors measuring 1-3/4&quot; thick, you would need the Commercial Overdoor Hooks White Pkg/4(item: 10054932) to use in place of the standard hooks which accompany the 24-Pocket Mesh Overdoor Shoe Bag. Can this be washed or laundered? We recommend cleaning our 24-Pocket Mesh Overdoor Shoe Bag with a damp cloth. Do the pockets hold heels well? The Overdoor Shoe Bag will hold heels depending on the size of the shoe as well as the height of the heel. It holds most flats and sandals though. We also recommend a few other overdoor shoe bags. Our 24-Pocket Mesh Overdoor Shoe Bag has been one of our best-selling closet products for about as long as we've carried it. And how could it not be? It's simple, straightforward and maximizes so. much. space behind almost any door. It can solve more storage challenges than it has pockets!